Except for the hard north-northeasterly wind, the gray skies, the spitting rain, the submerged dock, and the four yachts driven ashore along the beach, it might have been a July Saturday at Owen Park. There was a crowd, cars squeezed into every parking space up the hill almost to Main Street. Folks gathered in small groups, walked along the beach, and their dogs ran back and forth, exulting in the wind and the commotion. A doozy of a storm had done a lot of damage alongshore and inland, and it had not blown itself out, but the day’s higher than normal high tide was due sometime before noon, and the effort to refloat at least some of the stranded sailboats needed to happen. Fortunately, the ingredients needed to do the work had assembled themselves, as they had many times over decades. Word got around, and help showed up. Bob Douglas was there of course, because McNab, his wife Charlene’s handsome sloop, nearly 50 feet long, had parted her newfangled and inferior mooring, which was not up to its job. Captain Douglas called it a “rubber band mooring,” and his description got around. Many of those gathered at the beach might qualify as disciples of the captain’s long and influential career as a marine historian and wooden boat enthusiast. His 1964 topsail schooner Shenandoah, along with his evangelical devotion to wooden boats and the history of American sail, had its way with a cast of young men and women, many of whom sailed with him and then sailed their own wooden schooners, ketches, and sloops. 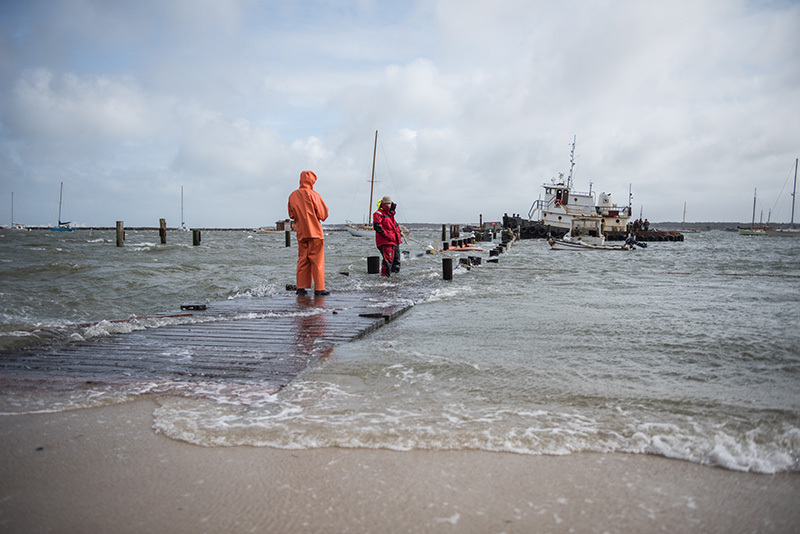 Ralph Packer was there because he loves boats and Vineyard Haven Harbor, and because whenever marine crackups occur, his tugs fire up to help with the difficult work of salvage. He remembers 1967, also March I think, when Shenandoah went ashore in a nor’easter at the bend in Beach Road behind the service station. Ralph’s tiny tiger, the 28-foot tug Ursa, pulled on her for hours before she came off the beach. Saturday it was Ralph’s tug Sirius, 65 feet, usually towing fuel barges or deck barges loaded with gravel for Island road building, or modular houses for Island residents, that got two of the stricken sailboats off the sand. With the wind blowing 30, with gusts higher, Sirius’ crew did a brilliant job. Captain Paul Bangs first hauled Heart’s Desire, a schooner owned by Matt Hobart and his family of Vineyard Haven, from the beach across the harbor near the Tisbury Wharf Co. Matt is a master boatbuilder at Gannon & Benjamin Marine Railway. Several of the G&B work crew joined in the salvage efforts. Captain Bangs drew Heart’s Desire off the beach, towed her to a safe anchorage, then gently put his tug alongside the little schooner to retrieve her crew, a delicate bit of work in a small gale for such a large, heavy, powerful, but not so nimble towboat. Captain Bangs left not a scratch behind. Next, Captain Bangs threaded the big tug through the mooring field behind the Vineyard Haven Harbor breakwater to help McNab. The crowd on the shore included sightseers, but it also included a collection of experienced marine operators. Of course, the core brain trust was Captain Douglas, Ralph Packer, and Captain Bangs, but there was a lot of advice available to them: Bill Mabee, a former Shenandoah mate, who made a career sailing tankers and freighters. Fred Murphy, owner of the Vineyard Haven schooner Ishmael, also a merchant seaman, was at hand. There was Rez Williams, the painter who sailed his small boat to New Bedford to sketch that harbor’s offshore fishing vessels, which became the subjects of his bold, much admired pictures. And David Dandridge, retired Steamship Authority master, answered the unspoken summons. Among the G&B crew was Lyle Zell, son of Ross Gannon. Ross built many of G&B’s wooden boats, as his son does now. Many of these were designed by Ross’s partner Nat Benjamin, who sailed into Vineyard Haven from the Mediterranean one day with his wife Pam and their two girls, and decided to stay. His designs, all in wood, including his own schooner Charlotte, which rode out the storm without a problem, populate the mooring field behind the Vineyard Haven breakwater. The wooden sailboat line from Captain Douglas has not been exhausted. The Owen Park dock was under water. Only the tops of the pilings were visible. Captain Bangs lay Sirius alongside what was the east face of the flooded dock. His plan was a clever one. It evaded the problem, with the wind blowing as hard as it was, of lining up and maintaining Sirius in position to tow McNab off, and guarded against the powerful tug’s damaging the yacht by pulling mightily and perhaps unsteadily on cleats or other of the yacht’s deck structures that might not hold. Captain Bangs chose to use Sirius’s capstan. That allowed slow, steady, smooth pressure to be brought to bear. A line had already been run between McNab’s stern and the Owen Park dock to hold her up to the wind. Three of the crew of helpers got in a skiff and floated hand-over-hand along the line to McNab. They took the towline from Sirius with them, and fastened it to a bridle they fashioned and dropped over McNab’s stern. Sirius’s capstan began turning. The tide rose the last bit it had to give, and slowly the yacht freed herself. It was a nifty morning’s bit of salvage work. There are several ways to look at all this. It was a dramatic morning for the casual spectator, better than if you were watching the TV news while some idiot staggered in the rain and wind with a microphone in his hand, imagining that he was delivering critical, life-saving information. If you were a tug captain, a salvage crew member, the owner of the stricken yacht, it was a meaningful, even heart-stopping event. If you were one of the bunch that has been here for a long time, been touched by the light Captain Douglas lit, or by the generous devotion Ralph Packer has for the waterfront and its devotees, it was another moment when the history you had been part of reminded you of its enduring authority. Two vessels, Witch of Endor, a black ketch that charters out of Vineyard Haven in the summer, and Rachel Saunders, a wooden sloop that G&B has done a lot of work on, remained on the beach when the day ended. Witch had the worst luck, hurled against the pilings at the north side of the Steamship Authority wharf. Rachel Saunders rests in the sand, not badly beaten up, and awaiting salvage.